BRUNSTON CASTLE Golf Course in Dailly, South Ayrshire will be opening its new Golf Shop at 12 noon this Saturday 27 February. Visitors will have the opportunity to take advantage of a half-price golf lesson if they book on the day of the opening. Announcing the opening of the new Golf Shop, Brunston Castle Golf Course general manager Cheryl Steven (pictured above) said that she was looking forward to building on the progress that the Club has made over the past twelve months. Over the past twelve months the Club management team has endeavoured to implement improvements in the golf course condition, upgrade clubhouse facilities, and standardise policies and procedures that will enable a more efficient and effective running of the company, thus allowing the re-establishment of Brunston Castle Golf Course as one of the leading golf courses in South Ayrshire. The Club has also re-branded all of its signage with a fresh look and a new logo, which will enhance the image of Brunston Castle Golf Course. In May 2009, the Club hosted the fourth Scottish Golf Union Junior Tour event, and the SGU has once again chosen Brunston Castle to host the event in May 2010. The Club is currently working with both Golf Tour Operators and Hoteliers to further develop its potential visitor client base. It will continue to encourage Junior Golf development and hopefully increase junior membership numbers, recognising that they are its future. Brunston Castle has also invested in a new minibus, which again will enhance the image of Brunston and will be offered to all parties. Brunston Castle has also seized the opportunity this year to sponsor Ladies European Tour player, Pamela Feegans. 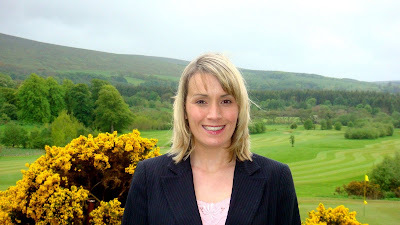 As part of her association with Brunston Castle, Pamela will be working very closely with the Club to help promote and develop the Brunston Castle brand and its attraction to players of all abilities, and will also be contributing a “Life in the day of a Tour Pro” blog on the Brunston Castle website. Pamela will be about the clubhouse from time to time when not on tour and will gladly give members some pointers for their own game. Brunston Castle Golf Club Green Staff will continue to endeavour to provide a course that both members and visitors are proud to play, and will gladly listen to and put forward to management for implementation any suggestions made regarding the betterment of the golf course. Cheryl Steven commented: “The condition of the greens this season could possibly be the best that anyone has ever seen at Brunston Castle, and we fully expect that with their continual maintenance, they will be every bit as good if not better next season. “And in an effort to upgrade our facilities, the work within the clubhouse has been completed with the walls being re-painted, new floor coverings throughout, in addition to the removal of a wall in the rear restaurant area, which has now created a brighter, more inviting, open plan facility. “We had a successful season in 2009, due mainly to increased use of the Clubhouse facility, including numerous weddings and special events, in addition to increased business through the restaurant. The Clubhouse has developed a reputation for providing a warm environment in which to unwind after a round of golf, but is also becoming increasingly popular for non-golfers to enjoy good food, in pleasant surroundings. “The Clubhouse will once again focus on further development of our weddings and function business going into 2010, with several weddings and significant events already confirmed for 2010, as well as numerous enquiries for 2011. “We anticipate that this trend will continue, but if you or someone you know are contemplating a golf outing, a function or wedding this coming year, then I hope that you will consider and/or recommend Brunston Castle Golf Course as the place to hold such special events. There are currently 664 Ayrshire business stories permanently archived on this site. To locate those of most interest to you, please use the site search facility in the top left hand corner of this page. Type your search term in the white box, then click the magnifying glass symbol.